Welcome to our guide of genealogical resources. Resources at DeWitt are mostly for people who resided in Sioux County and the vicinity. Most resources concentrate on people with Dutch ethnic roots. Name spellings can vary from resource to resource, so be sure to look at alternative spellings. Be sure to notice each source's dates of coverage. For example, a relative arriving in the United States in the 1920s would not be listed in a 19th century US census count. 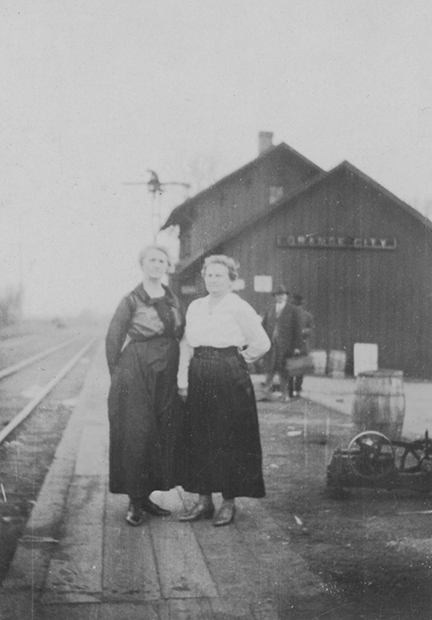 Photograph of 2 women at the Orange City depot, undated.